Allen Diesels has served the Indian Oil and Gas industry for fifty years. Our products have earned a reputation for reliability, efficiency and availability and have proved capable of operating effectively in hazardous conditions. Our engines are incredibly versatile and can operate on a variety of fuels (LSHS/furnace oil), crude oil, natural gas, dual fuel and even sewage gas. 71 Allen diesel engines have been supplied to the Indian Oil Corporation driving pumps on crude oil and finished product pipelines. 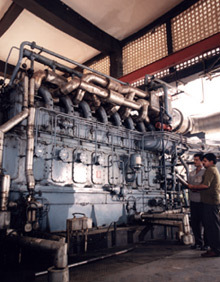 72 Allen diesel engines operate with Oil India Limited driving pumps and generating power on the Naharkatia to Baraundi crude oil pipeline, the largest single fleet of Allen engines. Incorporated in 1959, the Indian Oil Corporation Limited (IOCL) became a corporation in 1964 since when it has grown rapidly and has become the leading oil company in India in the areas of refining, pipeline transportation, and distribution as well as marketing and associated services. In addition, IOC also offers its expertise to other developing countries by way of consultancy services and joint ventures in the oil industry. For crude oil supplies to the Koyaliand Mathura refineries a new pipeline was built in the mid 1970's for which the Allen S37engine was chosen to drive the mainline pumping units. Running from Salaya, on the Gulf of Kutch, to the Mathura refinery, four Allen powered pumping stations were built in the first phase of the pipeline system. The system has a total length over 750 miles and an original capacity of 7.5 million tonnes per year to the Mathura refinery and 5 million tonnes per year to the Koyali refinery. The expansion for the increase in throughput to the existing refineries and additional refinery at Panipat will require an additional 6 million tonnes per year to be pumped through the pipeline, as far as Chaksu where the new spur pipeline will run to the additional refinery at Panipat. The first (mother) pumping station on the IOC pipeline is at Salaya in Gujarat and is the starting point for the long journey to the inland refineries. Using Allen speed increasing gearbox, the 3,000 rpm mainline pumps are driven by three separate 2,289 bhp 12-cylinder configuration Allen S37 engines, running at 600 rpm. All the components built or supplied for the station by Allen Diesels meet API standards for hazardous area operation. Control equipment on the engines is pneumatically operated and the pneumatic signals are converted to electrical signals by an interface panel installed in a safe area. The crude oil is first treated by centrifuging before delivery to the service tanks. These feed the engine fuel oil re-circulating system which maintains the correct viscosity and temperature of the fuel. Crude oil with widely differing characteristics are pumped in this pipeline and come from Middle East oil-fields, as well as Bombay High and require maximum versatility in heating and centrifuging equipment. Experience has led to the latest installations being equipped with larger automatically cleaned centrifuges because of the high level of sediment in the crude oils being pumped. At Viramgam, 100 miles inland, the pipeline is split. The first section, delivers 5 million tonnes per year to the Koyali refinery and terminal, while the second section pumps 9 million tonnes per year along the main pipeline to Mathura. In the first phase these were booster stations at Abu Road and Sendra. In 1987 additional intermediate booster stations at Sidhpur and Kot were installed and Sendra had two more engine pump units installed. In 1995 a further 23 engine pumping units were supplied and installed over ten pumping stations to increase the capacity at the Salaya Mathura pipeline, to supply the new Panipat refinery. Pumping stations were established with Allen 6S37 or 8S37 units arranged as two duty and one standby. An additional pumping unit was installed and commissioned at the Salaya site in 1999 as part of an expansion to increase throughput to the Koyali refinery. Three more Allen 6S37 engine pumping units were installed at Bareja to increase throughput to 6.5 million per annum in 1999. All of these engines were arranged with single fuel systems burning the crude oil being pumped through the pipeline. Initial heating of the crude oil fuel is effected indirectly through a hot water system heated by electrical immersion heaters until the crude reaches correct temperature for fuel injection. 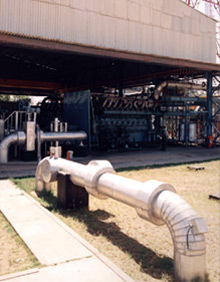 Once the first engine is started and on load, engine jacket cooling water is used to heat the crude oil system. When up to temperature, with one or more of the engines always in operation, the crude oil system is maintained at the correct operating temperature and no external electric heating is necessary. Starting and stopping of the engines on crude oil is similar to that now achieved in Allen heavy fuel oil systems. The fuel oil system is constantly operating and circulating heated crude oil through the engine fuel pumps. The fuel injector temperature control system remains on and maintains the correct operating temperature of the fuel injectors. The fuel oil centrifuge module, circulating module and service tanks all share heat from engine jacket water systems adding to the overall economy, readiness and efficiency of the station. The single fuel system eliminates the need for a changeover arrangement from one fuel to another in these IOC pumping stations. In 1994 nine Allen 8S37 engine driven pump sets were supplied and installed in three stations in the new Kandla Bhatinda Product Pipeline. This pipeline pumps High Speed Diesel, Light Diesel Oil (LDO), Kerosene and motor gasolines, from the Panipat refinery north to Bhatinda and south west to Kandla. Engines were arranged to operate fuelled by distillate or Light Diesel Oil (which has high wax, water and sulphur content requiring special handling. A further four Allen 8S37 engine driven pump sets are being installed in 1999 at two intermediate stations, Sidhpur and Sanganer to increase the capacity of the pipeline to 8.5million tonnes per annum. As Panipat grows further expansion is underway. Indian Oil Corporation quality initiatives have lead to over 55 of its units earning ISO9001/9002and Salaya Mathur pipeline has 14001 accreditation. SCADA systems installed during 1998 are now fully functional with the station at Chaksu incorporating leak detection at an accuracy of 2 per cent of flow rate within three minutes. 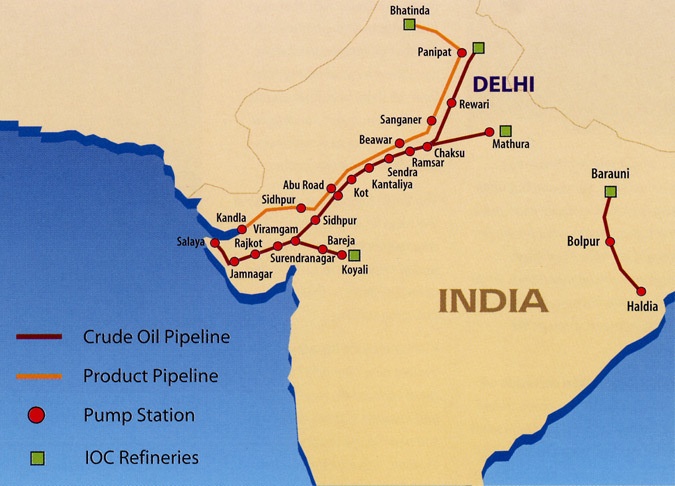 IOCL completed commissioning of the new Haldia to Barauni crude oil pipeline in February 1999. This delivers up to 6.2 million tonnes per year of crude oil from Haldia port to the Barauni refinery. There are two pumping stations on the pipeline each with three 6-cylinder S37 engines developing 2,100 bhp at 750 rpm. In the summer of 2000, two additional engines were installed to increase the throughput to 7.5 million tonnes per year.